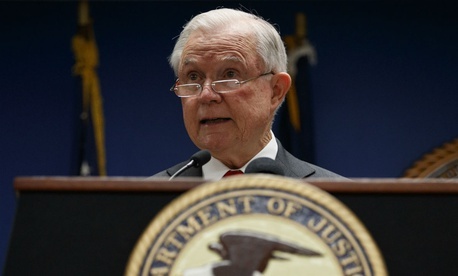 Attorney General Jeff Sessions on Monday took aim at a judge who ruled against the Justice Department in allowing litigation by 18 states to proceed in challenging the Trump administration’s controversial plan to restore a long-abandoned question on citizenship to the 2020 decennial census. The dig is an apparent reference to Judge Jesse Furman of the Southern District of New York, who ruled on Sept. 30 that the litigation over Commerce Secretary Wilbur Ross’ evolving statements on why he overruled Census specialists to add the citizenship question can continue. On Oct. 7, the Supreme Court paused the case, scheduled to be heard next month in New York, to consider the Trump administration’s argument that Ross should be shielded from giving a deposition. Addressing the merits of the case, the attorney general said, “the Census question—which has appeared in one form or another on the Census for over a hundred years—is either legal or illegal. The words on the page don’t have a motive; they are either permitted or they are not,” he added. “But the judge has decided to hold a trial over the inner-workings of a Cabinet secretary’s mind. Ross had announced last March that Census was planning to add a citizenship question despite warnings from data scientists within the bureau and among outside critics that such a question frightens some respondents away from completing the census form. Ross had originally said that he acted because the Justice Department needed such data to monitor voter fraud. But subsequently, emails emerged suggesting that the idea may have come from the White House and anti-voter-fraud activist attorney Kris Kobach, a Trump voting rights adviser now running for governor in Kansas. Ross faces accusations that he misled Congress on what motivated the question when he answered queries by Rep. Grace Meng, D-N.Y., by saying he “wasn’t aware” of any discussion with the White House about adding the question. "The Justice Department's efforts to add a citizenship status question to the 2020 census are deeply problematic given this administration's hostility to communities of color–which include immigrant people–in both its rhetoric and policies," said Leah Aden, deputy director of litigation at LDF. "The American people deserve to know the precise reasons that the Justice Department has been so intent on including a citizenship status question on the next census. We do not believe it’s in order to protect minority voting rights, as the department claims. If the department has nothing to hide, it should disclose the requested materials." Austin Evers, executive director of American Oversight, added, "The Trump administration has never told the American people the truth about the citizenship question, and it is increasingly clear that DoJ engaged in a pretextual exercise to justify a political decision that could have serious consequences for the accuracy of the census."